When we were kids, Dad would take us on marathon summer drives from Wyoming up to Canada. He was a driving machine, often putting in 18 hour days so we could get north in a hurry. In what now seems like a right of passage, we did the trip in a Dodge van that had a dodgy cassette player. Fortunately, Dad brought all the music we would ever need. 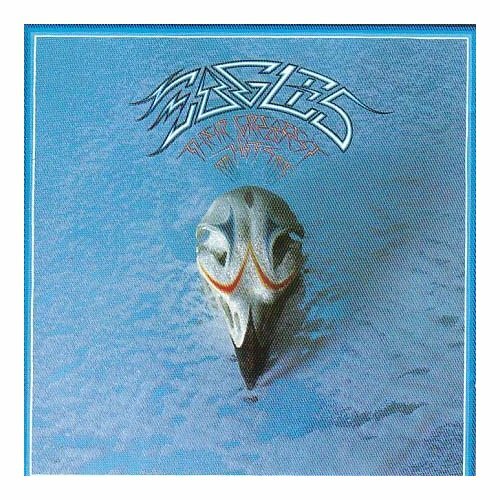 A single cassette tape of the Eagles Greatest Hits, Volume 1. We must have listened to that tape hundreds of times, only stopping when the cassette player ate the tape. Which it did often. Somehow, we always fixed it. If you are under 30, you may not know what I’m talking about. If you are over 70, you may also not know what I’m talking about. Cassette tapes were kind of a 70s and 80s thing. Anyway, that meant we heard “Take it Easy” a lot. An awful lot. 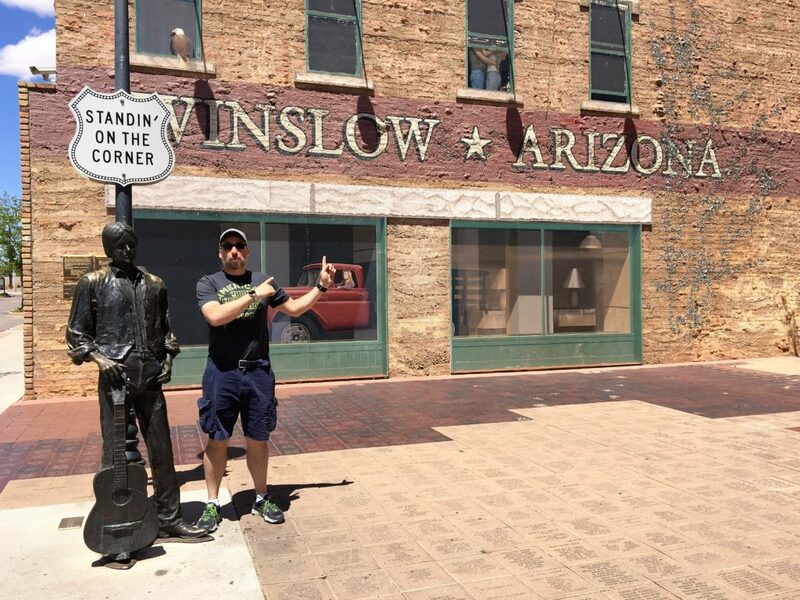 Someday, I knew my destiny would be to stand on that corner in Winslow Arizona that Glenn Fry was singing about. We arrived just at the right time and were able to park our Jeep right there! The town of Winslow has even parked a red flatbed Ford truck on the site. 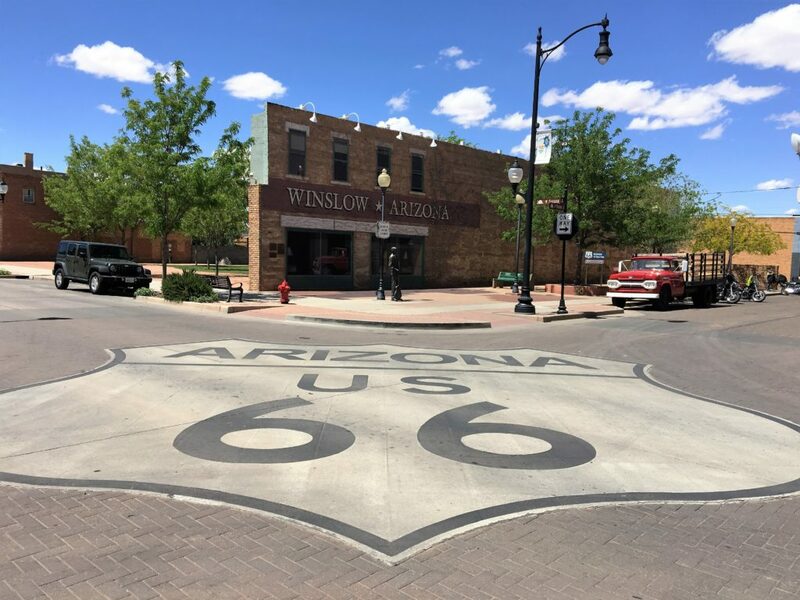 The corner is right on historic Route 66 which plays such a central role to the development of many Arizona towns – and bypassing Route 66 led to their demise as well. Unfortunately, time has not been kind to Winslow Arizona. Once a booming railroad town, the fortunes of Winslow have declined since Barstow CA got the diesel engine repair yards. 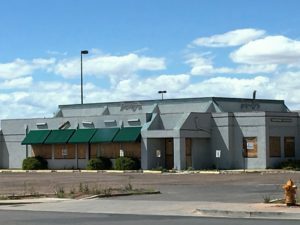 There are a LOT of abandoned and boarded up buildings in Winslow, particularly near the downtown area. 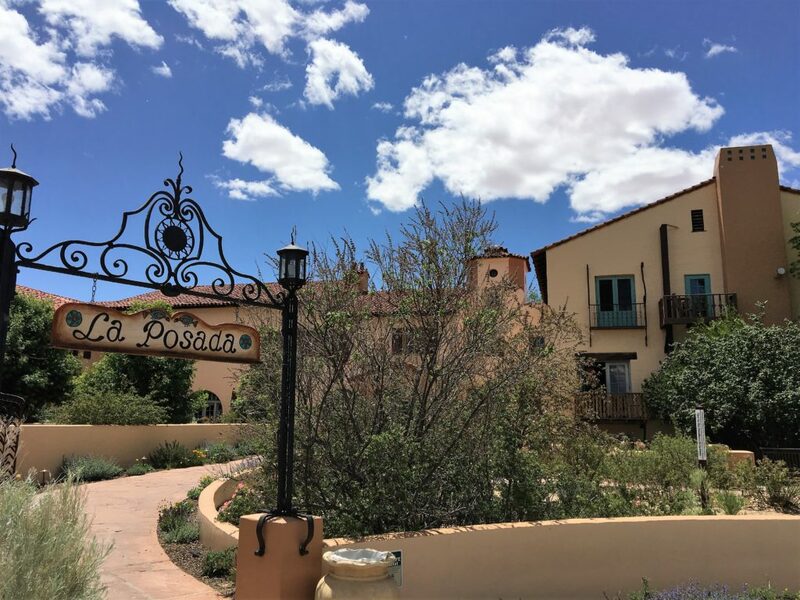 One of the most impressive spots in Winslow is the La Posada hotel, one of the last Harvey Hotels, a chain of famous railroad hotels that set new standards for architecture and hospitality. 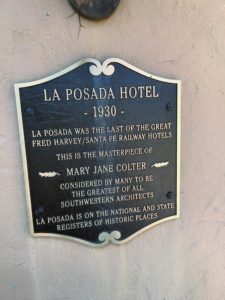 The La Posada was designed by Mary Jane Colter, a famous southwestern architect who also designed some of the iconic buildings at the Grand Canyon. La Posada was turned back over to the railroad in the 1960s. They wanted to tear it down and build a new business headquarters. 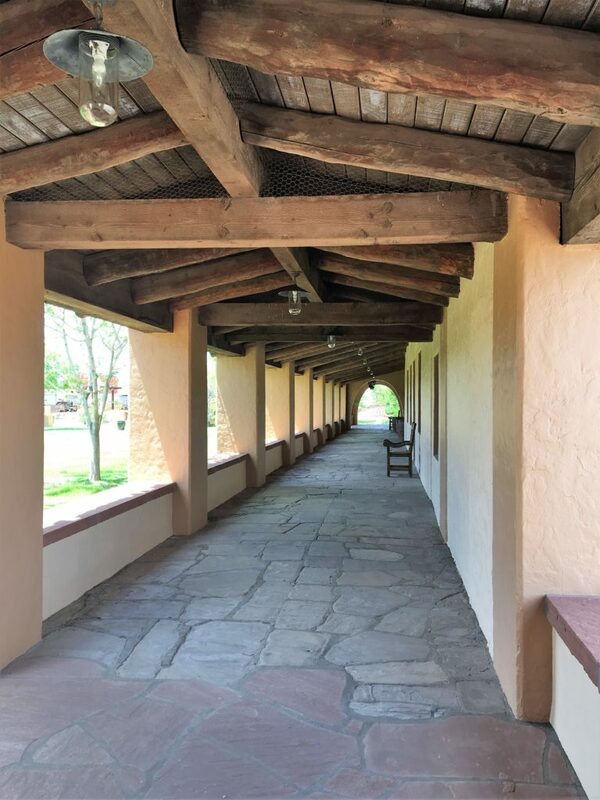 Fortunately for the La Posada, it was built out of 22′ thick reinforced concrete. That made it too expensive to tear down, so the railroad converted it into their business office. Flagstone floors were covered in vinyl tile, arched doors were plastered over, and vaulted ceilings were covered in acoustic tile and fluorescent lighting in an attempt to “modernize” the building. 40 years later the railroad offices had left, and they needed to unload the building. They offered it to the city of Winslow for $1, and the city refused. Fortunately in 1997 visionary investors secured a grant and began restoring the hotel. Today it is one of the finest hotels in Arizona! It is located directly on the railroad tracks and serves as the Amtrak stop for Winslow. 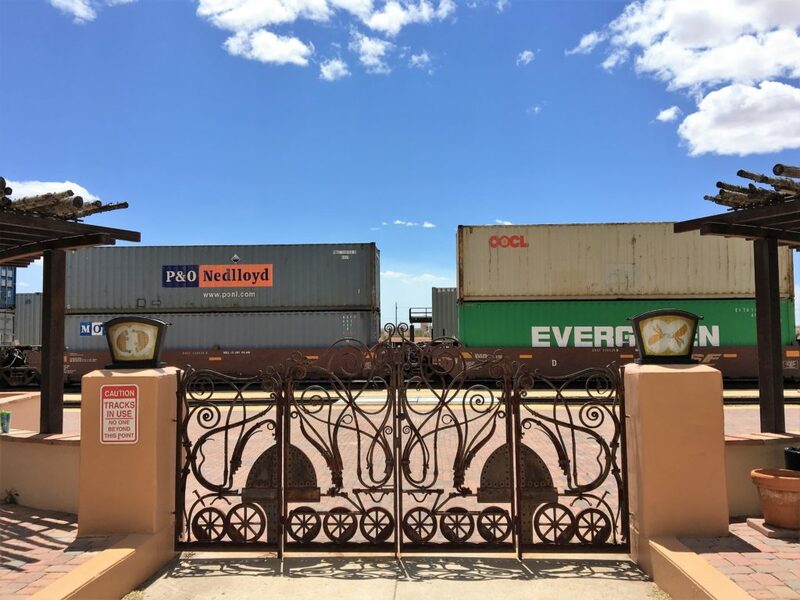 Train passengers literally step off the train and through the front gates of the La Posada. 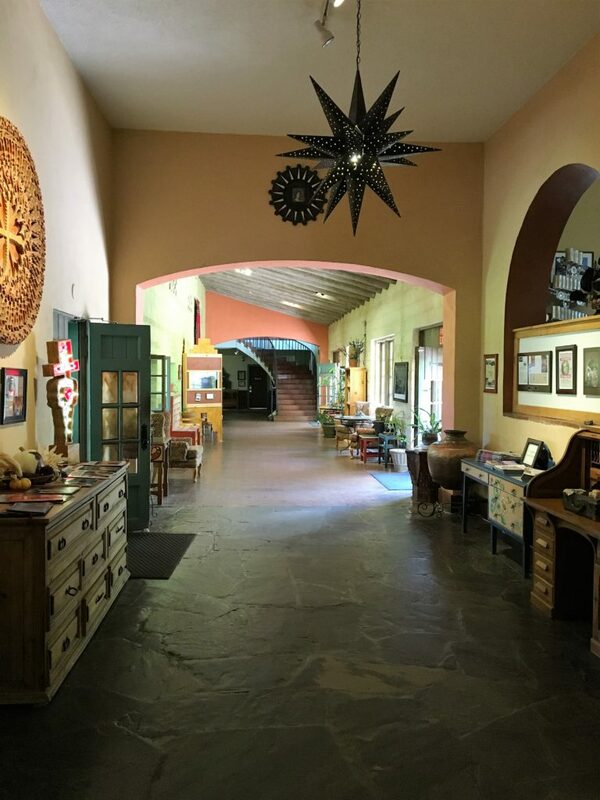 It is a gorgeous hotel built with solid wood beams and stucco walls. The preservation efforts have paid off and the hotel looks much as it did in its 1930s heydays. We ate a fabulous lunch in the famous Turquoise room. If you are in Winslow, you need to have a meal in the Turquoise room! After we left, we stopped at the ghost town of Meteor City. 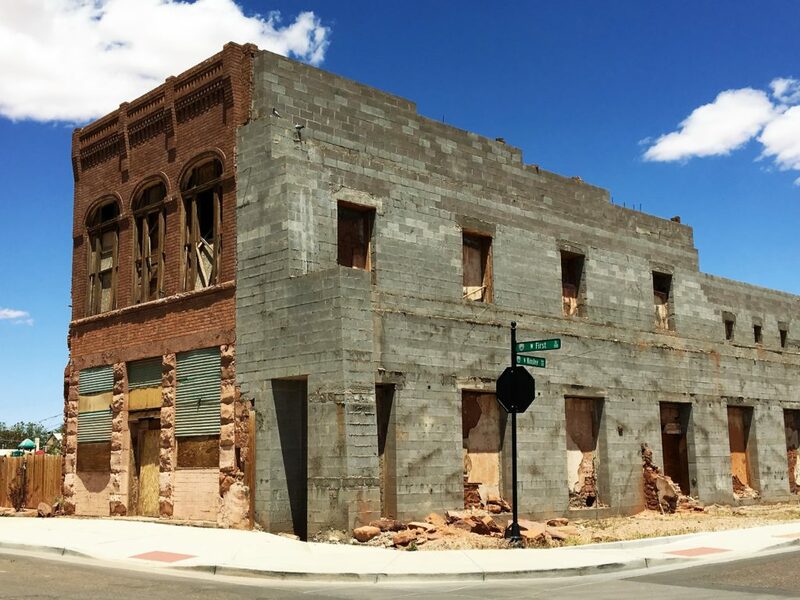 This town on old Route 66 vanished when a new route to Meteor Crater was established. 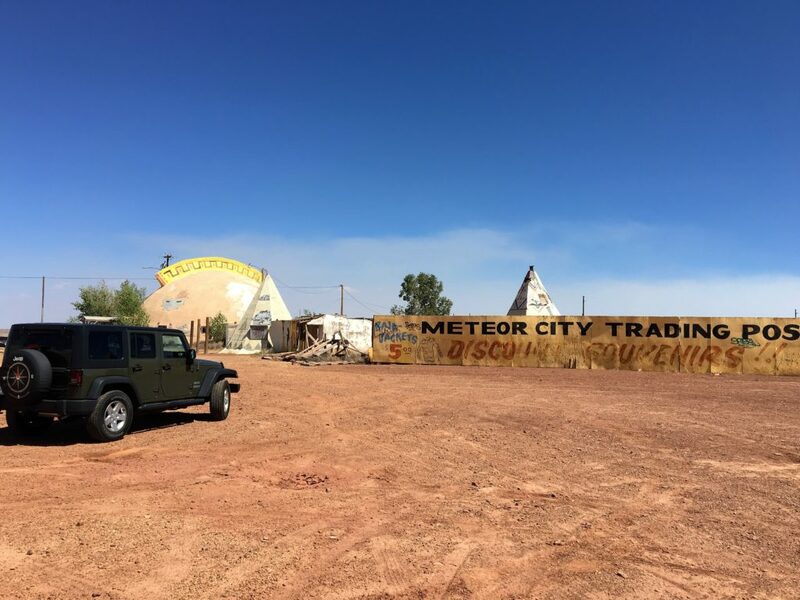 There are many ghost towns along route 66 but Meteor City is one of the most obvious from the new I-40. 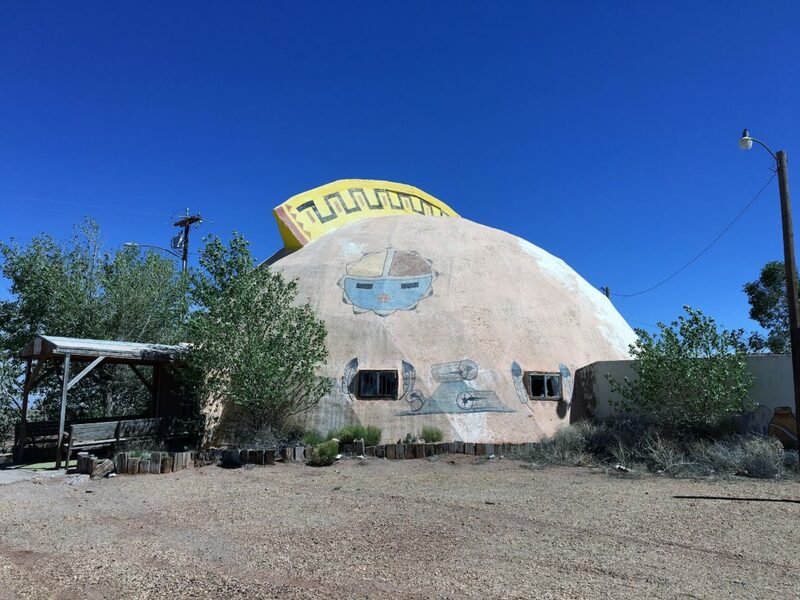 The somehow both futuristic and dated dome of the gift shop, complete with Mohawk, dominates the remains of the town. 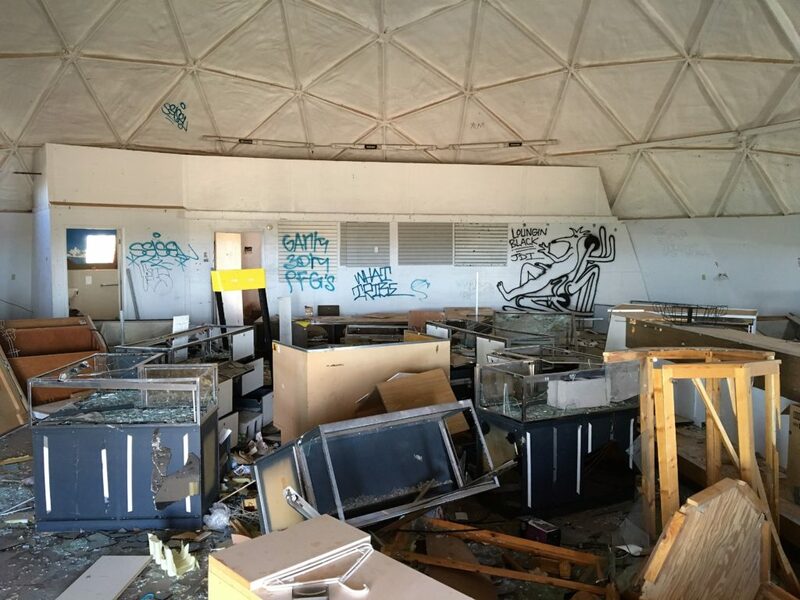 The interior is full of display cases and graffiti. Like a lot of artifacts in the area, the contents are well preserved because of the dry climate. 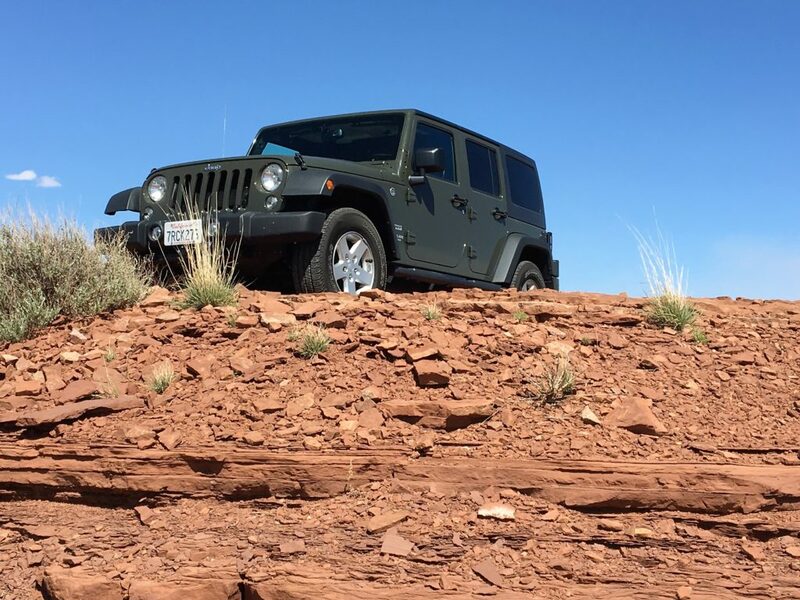 Of course, we couldn’t resist doing a little off roading in the Jeep!